And so we come to the crossroads. The Two Towers is the second installment in Peter Jackson’s epic film adaptation of J.R.R. Tolkien’s The Lord of the Rings – the installment poised to make or break the trilogy. Could Jackson and company follow up on the blockbuster success of 2001’s The Fellowship of the Ring? Would the film continue with the same level of quality? Would the momentum of the story build upon the climax of the first film, and prepare audiences for the ultimate confrontation between good and evil in the soon to be released final chapter, The Return of the King? The answer to all of these questions, of course, is a resounding yes. As the film opens, we find ourselves plunged into the dark mines of Moria, to relive a few moments of Gandalf’s confrontation with the fiery Balrog. But instead of playing out as we remember it in Fellowship of the Ring, this time, when Gandalf falls into the abyss, we fall with him to watch as his fight continues. 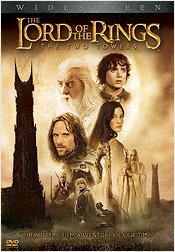 The consequences of these moments will resound throughout much of the remainder of the story, as Frodo and Sam continue their quest to carry the One Ring into Mordor, and Aragorn, Legolas and Gimli race to save Merry and Pippin from the orcs. Along the way, two important new story elements come into play. The first is the character of Gollum, who is bound to the Ring in such a way that he simply must follow it to Mordor. As we watch, Gollum’s dual personalities fight for dominance, one wishing to help Frodo and Sam in their quest, and the other seeking to kill them and take back the Ring that was stolen from him (as told in The Hobbit). Meanwhile, Aragorn and company have made their way into the horse realm of Rohan, whose king has fallen under Saruman’s dark spell. The people of Rohan are made to suffer too, for Saruman has built a army of murderous orcs numbering ten thousand strong. Together, the white wizard and the dark lord, Sauron, mean to rule Middle-earth, and their first step in this conquest is to wipe out the kingdom of Rohan, and all of Mankind, once and for all. What follows is nothing less than a truly epic battle, in which the fate of both Middle-earth and the Quest of the Ring literally hang in the balance. Trust me when I say, it’s like nothing you’ve ever seen before on film. What I appreciate most about The Two Towers is that Jackson has made no compromises for the audience. Middle-earth is a world where violence is commonplace, much blood is shed and evil stands a very real chance of winning and must be confronted head-on. There is no sugar coating on these bitter pills to make them easier to digest. As a result, the journey one takes in this film is just that much more satisfying. An additional compromise that Jackson manages to avoid is obvious right from the opening frames of The Two Towers. You simply must have seen the previous film in order to understand what’s going on, because there is no recap of the action. Other than the very brief opening flashback, this film launches you immediately into the story, picking up right where Fellowship left you hanging. And the pace throughout much of the film is relentless, pausing only occasionally (mostly involving scenes in Fangorn Forest) to let you catch your breath. In addition to Jackson’s deft direction, the savvy adaptation and great performances by cast members new and old, there is much technically to be impressed with here as well. The character of Gollum, entirely created by computer graphics, is astonishing. At last, we have a CG character that gives a real dramatic performance on screen. This is thanks to the work of WETA Digital, as well as the strong acting of Andy Serkis. Serkis not only provides Gollum his voice, but also his movement thanks to the process of motion capture. And Serkis also performed the character on set with the actors, lending the final digital creation a particular presence and immediacy it would otherwise have lacked. Equally wondrous is the astonishing battle for Helm’s Deep, in which literally thousands of computer generated soldiers, both good and evil, fight to the death. Each tiny digital character engages in unique and believable combat moves, thanks to a special program written for the film trilogy called Massive. The result is a truly jaw-dropping and epic battle sequence, which gives moviegoers a taste of the even larger battles to come in Return of the King. As far as my letter grade for the film, I do believe that, in many ways, The Two Towers is a better film than The Fellowship of the Ring, with more action and a better sense of pace. But it does suffer a little from lack of build-up, given that the real beginning of the film isFellowship. Where I do expect this film to get even better than the original is in the Two Towers: Extended version. We’ll just have to wait and see. The anamorphic widescreen video found on Disc One of this DVD set is quite good, easily on par with the quality of the 2-disc Fellowship of the Ring DVD, and perhaps even just a little bit better. Once again, there’s excellent contrast in the image, with muted but accurate color rendition that is perfectly in keeping with the more subdued color palate of this second film. There is some noticeable edge enhancement occasionally, while a few scenes appear slightly on the soft side (though neither concern is overly distracting). As with Fellowship, Two Towers suffers somewhat from the fact that such a long film has been compressed onto a single dual-layered DVD, but the resulting picture artifacts are less obvious, even to a trained eye (most people will never notice them). All but the most demanding home theater enthusiasts will be happy with the quality of this video presentation. And, for those folks, there is always the Two Towers: Extended DVD to look forward to, which will no doubt feature significantly higher video bit rates given that the film will be split over two dual-layered DVDs. On the audio side of the coin, The Two Towers is a sonic marvel. This is a wonderfully active and immersive Dolby Digital 5.1 EX mix. There is fantastic dynamic range in play here, with both passages that are quiet and atmospheric and others that are absolutely thunderous. The battle of Helm’s Deep, with its pounding war drums and snarling orcs, will definitely put your subwoofer to work. And there’s thrilling directionality in the mix, as the arrows whisper and fly, and swords clash all around. The soundstage is big and wide, yet precise, and Howard Shore’s epic score is once again perfectly blended into the mix. This audio is so good that we simply can’t wait to hear the DTS 6.1 ES track on the forthcoming Extended DVD. The extras on Disc Two are also very similar to the offerings on the Fellowship two disc set. To start with, there are a pair of documentaries which take you behind-the-scenes on the production. On the Set was made for Starz Encore, and runs about 14 minutes. It includes plenty of interview clips and a few interesting and funny anecdotes, but it’s a featurette of the rather superficial and fluffy variety. The meat of Disc Two is Return to Middle-earth, which originally appeared on the WB network, and runs some 45 minutes. It’s a more elaborate piece, with many more anecdotes on the making of the film, a closer look at the characters and new plot developments and more interview clips. Both are worth watching once, but you definitely get the idea that the best documentary material is being saved for the Extended DVD release. In addition, if you have the 4-disc Fellowship: Extended DVD, some of this will look awfully familiar. A nice treat on this disc is the inclusion of Sean Astin’s short film, The Long and Short of It, which was made for fun during the long months of production on the trilogy. It’s a charming tale that reaffirms the notion that each of us has a contribution to make in the world, and that we’re at our best when we work together. Watch for a cameo by Peter Jackson himself. There’s a piece on the making of The Long and Short of It as well. You also get eight brief featurettes that were originally created for the official website, the film’s various trailers and TV spots, Emiliana Torrini’s music video for Gollum’s Song (the haunting lament that ends The Two Towers), a preview of the forthcoming EA video game based on The Return of the King, and DVD-ROM weblinks. By far the best of the extras, at least by my reckoning, are the previews for both the 4-disc The Lord of the Rings: The Two Towers – Special Extended DVD Version (which streets on 11/18, and features 43 minutes of new footage restored back into the film) and the final chapter in the film trilogy, The Return of the King (which arrives in theaters on 12/17). The highlight of each preview is a first chance to view new film footage, including a look at some of the scenes set to be restored in the Two Towers: Extended DVD and about a minute and a half of material from Return of the King. Some of you may have seen the latter, as it was leaked on the Internet in recent weeks. All in all, none of this content is gonna rock anyone’s world. But it’s an adequate batch of material if you consider that it’s really meant as an appetizer and not the main course. 11/18 can’t come fast enough for me. It’s worth noting that my packaging didn’t come with rebates for the upcoming sets, but rather with a catalog advertising Noble Collection props and collectible products from the films and an “Adventure Card” which is apparently a marketing or cross-promotion piece (you can apparently win stuff, etc). I believe this also allows you to get rebates on New Line DVDs and Rings products. Could it be that The Lord of the Rings will at last be that Holy Grail for genre film fans? Will we finally be treated to an epic genre trilogy in which the first film is critically and technically amazing, the next is even better and the best is saved for last? Thankfully, we have only four months left to wait and find out. But I’ll tell you this much: it’s looking pretty good so far. Keep your fingers crossed. And rest assured, there will be plenty of Rings goodness to enjoy this holiday season.